This How To will walk you through how to take plain text, images, and links and compile them into an effective email using the drag & drop editor. Why should I care about email design? Our human brains tend to crave things that are well-made over things that aren’t. Design creates value both on a conscious and subconscious level. It helps us sift through the nonsense quickly and get to the good stuff. And remember: no matter how big or small your brand is, you’re still going toe to toe with companies that devote a lot of resources to design. Thankfully, even if you aren’t a designer by trade, with the drag & drop editor you can create emails that will stand up to the best of them. 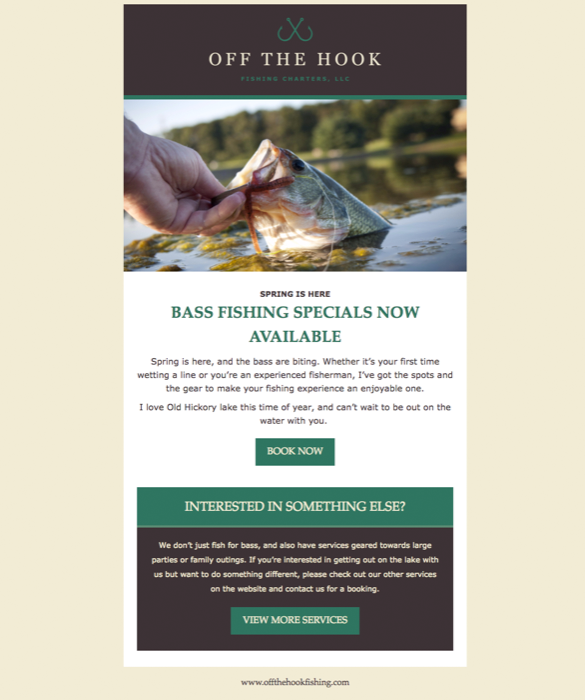 Off The Hook Fishing Charters, LLC, is a humble (and fictional) company that takes people fishing on Old Hickory Lake. 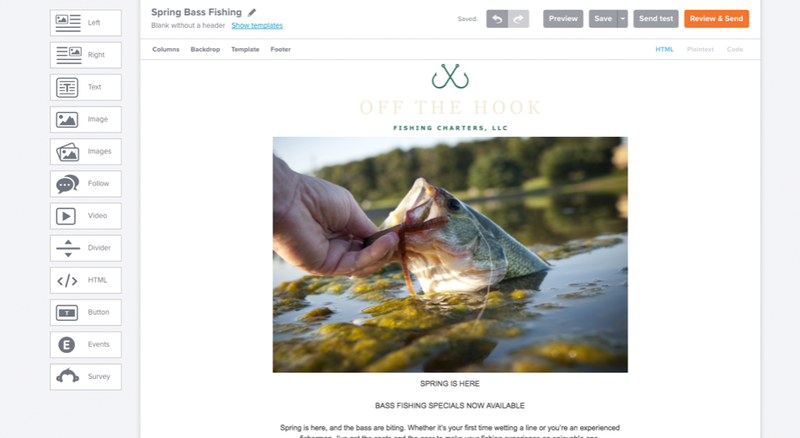 The owner, Joe, has sent over an example of an email he’s working on and asked for recommendations and tips on how to make it look nice using the editor. Step 1: What is the goal of your email? • Does my content help or hurt this goal? • Is any of this excessive, or should it be a separate email entirely? Initially, Joe listed every single service he offers, and he wanted to send the email to his entire list. 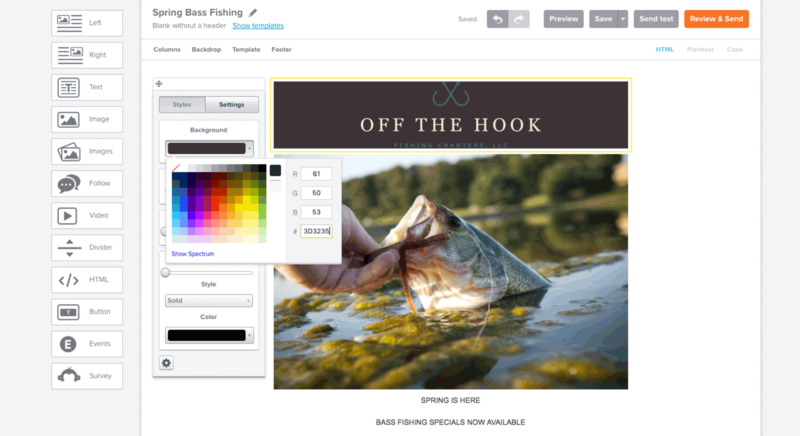 Instead, we’re going to target a specific audience that has expressed an interest in spring bass fishing. Let’s gut this and gather some new assets. Now that we’ve decided what content is relevant to the message and gathered our images, we just need to get it in the editor so we can start working with it. Nothing here is final; we’re just getting all the text in place and uploading images. If you ever study art or design, two of the most fundamental concepts you’ll learn are hierarchy and contrast. These things are ESPECIALLY important with text because it subconsciously tells readers what’s most important, and in the case of interactive media, what you can click on. Joe needs to come up with some basics on how to style his headers, sub-headers, links, and plain paragraph text, then apply that throughout his communications. 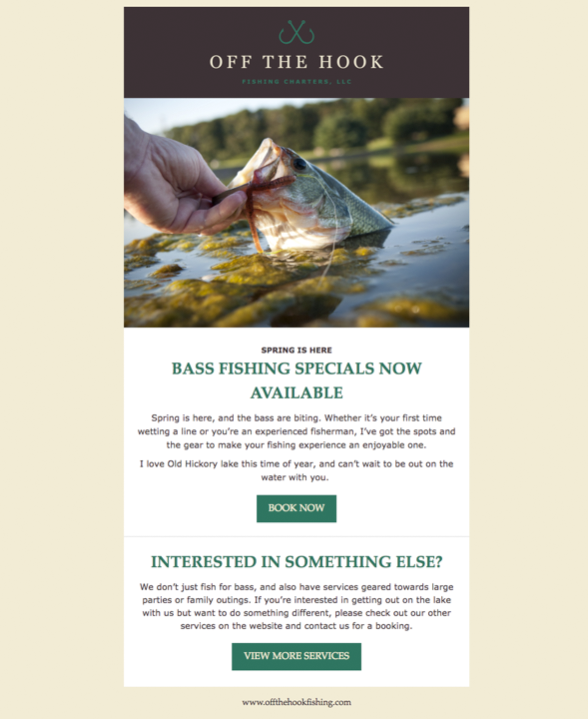 It doesn’t have to be the exact same every time, it just needs to make sense for that specific email. He should also establish a basic color palette. Again, it’s ok to stray every now and then, but he should aim for consistency. Believe it or not, space is just as much a design element as color or text or images. 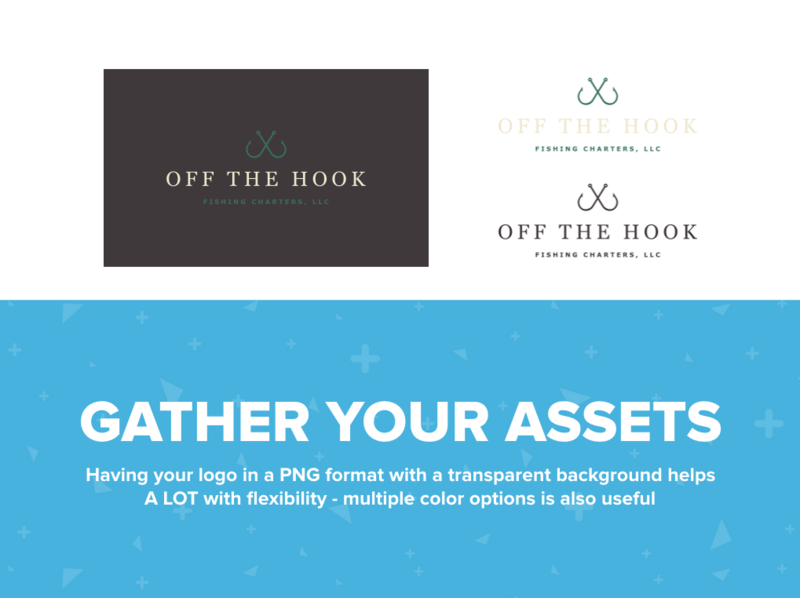 Some designs call for things that are grouped together compactly, while others have generous amounts of padding and margin between elements. Some have a combination. 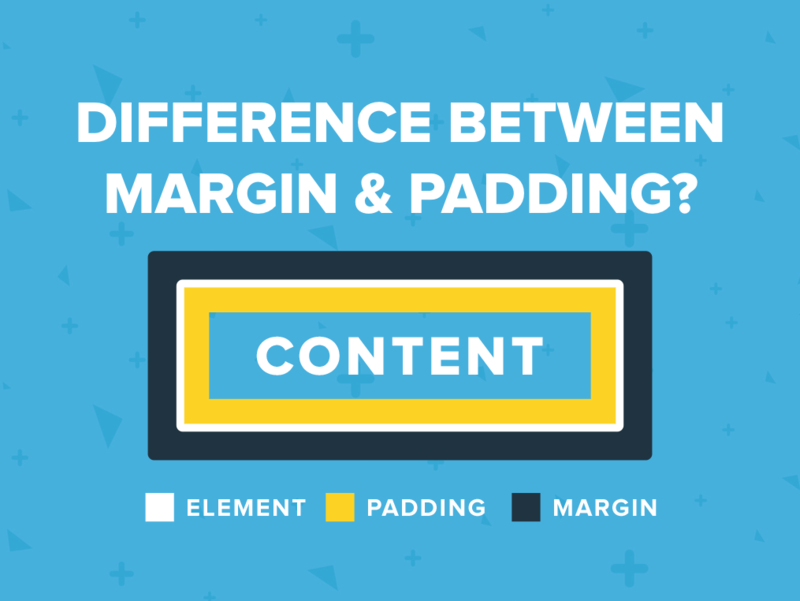 Let’s apply an appropriate amount of margin and padding to our design. Now, let’s spruce it up with a few other small things: “bezels,” borders, dividers, etc. None of these are required, but they can add that extra layer of polish that makes everything look well put-together. Now doesn’t that look much better? Hopefully, this new-and-improved design will help Joe book more charters and grow his business! 1. Self-audit and edit your content to be brief and compelling – the more targeted, the better. 2. 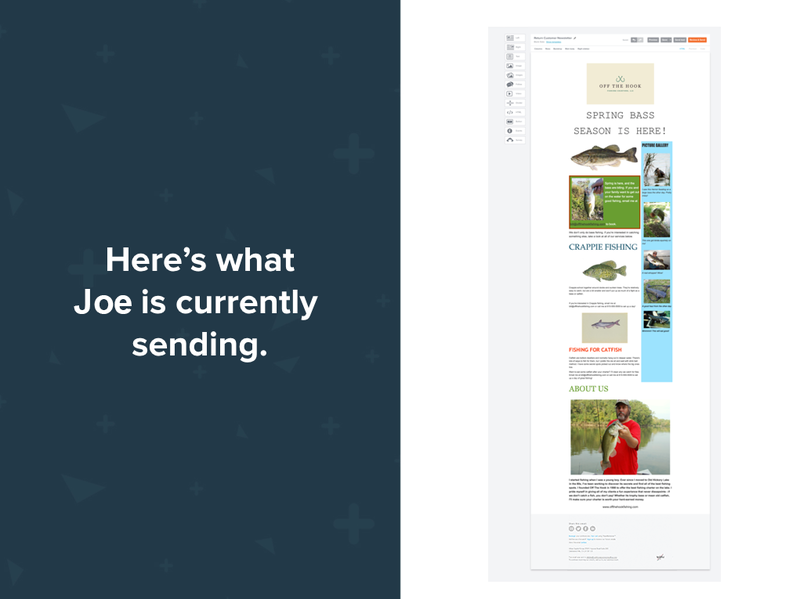 Find or create relevant, high-quality images to accompany your text, then add your text and images to the editor. 3. 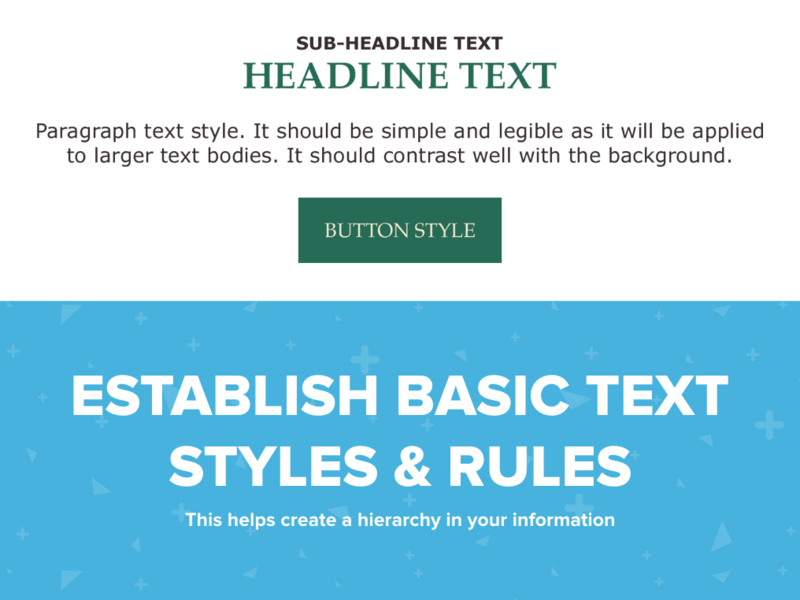 Establish a hierarchy/general style guide to follow. 4. Add appropriate padding or margin. 5. Consider extra touches for more polish. Voila! You’ve got a nice mailing.